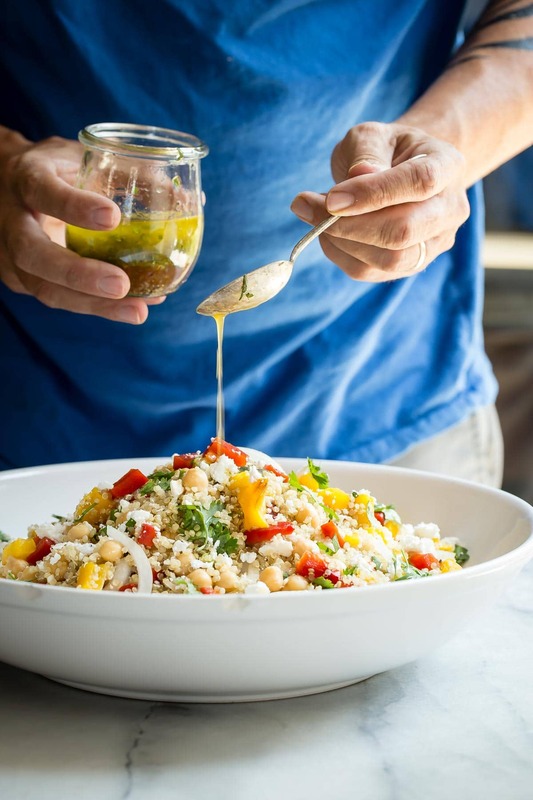 A healthy superfood Quinoa Feta Salad packed with garbanzo beans, roasted peppers, onion and feta cheese. Add some grilled chicken or shrimp for the ultimate healthy salad! Yesterday was a whirlwind day of unintentional phallic Bloody Mary drinks (check my Instagram feed if you’re wondering), lots of searching for sea animals at the beach and eating lobster truffle mac n’ cheese! 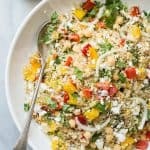 So it seems appropriate to start a new week with a healthy salad, just like this Quinoa Salad with Feta Cheese! 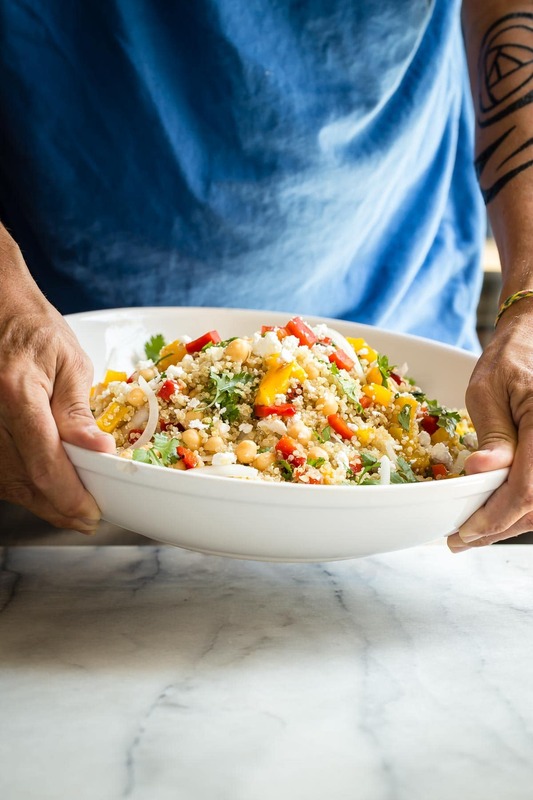 How to make this easy quinoa feta salad. Quinoa which has been around for thousands of years is now classed as a superfood. It’s packed with protein and low in fat and calories so it’s pretty much the perfect grain to use for healthy side dishes and salads or even soups! It’s no secret that I really like grain salads and most of them on my blog are results of fridge clean ups believe it or not. There’s not many ways to screw things up using some simple veggies, a little cheese, and some olive oil and lemon or balsamic. This salad is packed with fresh tasting ingredients and loaded with protein, but if you feel like adding some grilled chicken or shrimp, I wouldn’t stop you! Like this grilled chicken rice bowl or maybe a huge platter of pan-seared scallops with orange mango salsa? or glorious Garlic Shrimp. 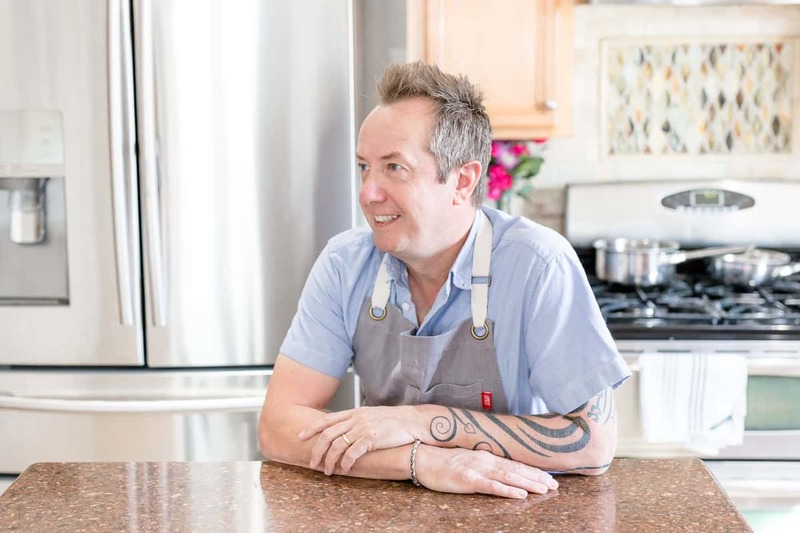 Why should I use quinoa? There are many different forms of quinoa though they all have pretty much the same nutritional content. Flavor is the easiest way to tell the difference. Paler colors of quinoa will have less flavor than the darker versions. I used white quinoa which tastes great but you can use any color you like. It’s an excellent filler grain for salads and power bowls and can easily be made a few days ahead of time. It’s a great idea to make a big pot at the beginning of the week and use it for multiple lunches and dinners! 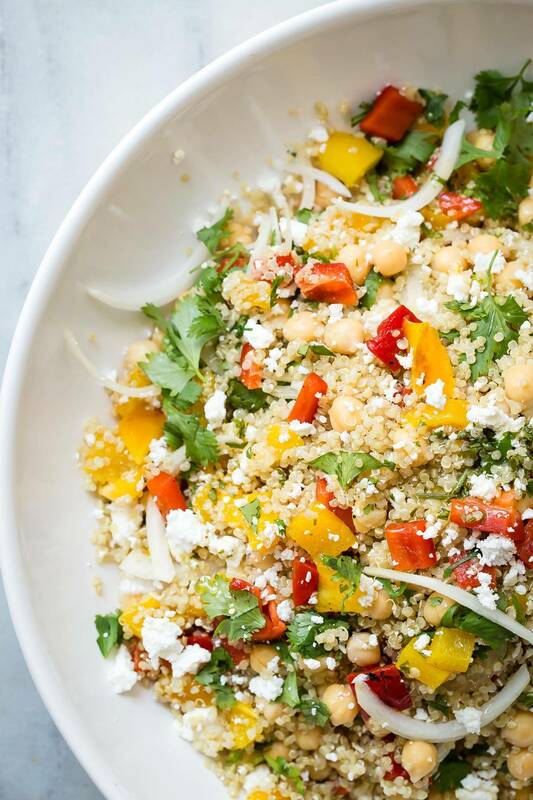 Fresh cilantro, roasted peppers, garbanzo beans are all tossed with the quinoa feta and a garlic and lemon dressing. Super easy, healthy, tasty and less waste in your fridge! This is one of my favorite summer recipes and I always make it for pot luck parties. Everyone loves it and I always end up being asked for the recipe! Here are some of my other favorite quinoa salad recipes! 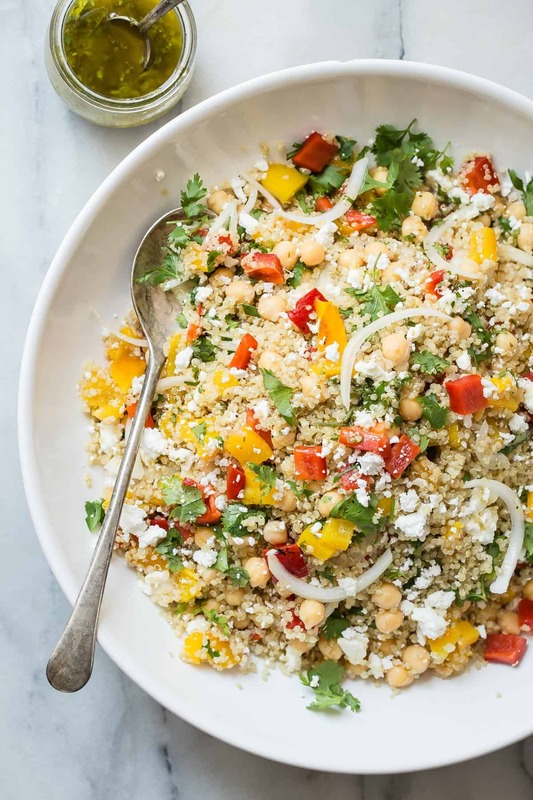 A healthy superfood Quinoa Salad packed with garbanzo beans, roasted peppers, onion and feta cheese. Add some grilled chicken or shrimp for the ultimate healthy salad! Place the quinoa and water in a pot and cook according to the instructions on the pack, about 15 minutes. Let cool in the fridge. 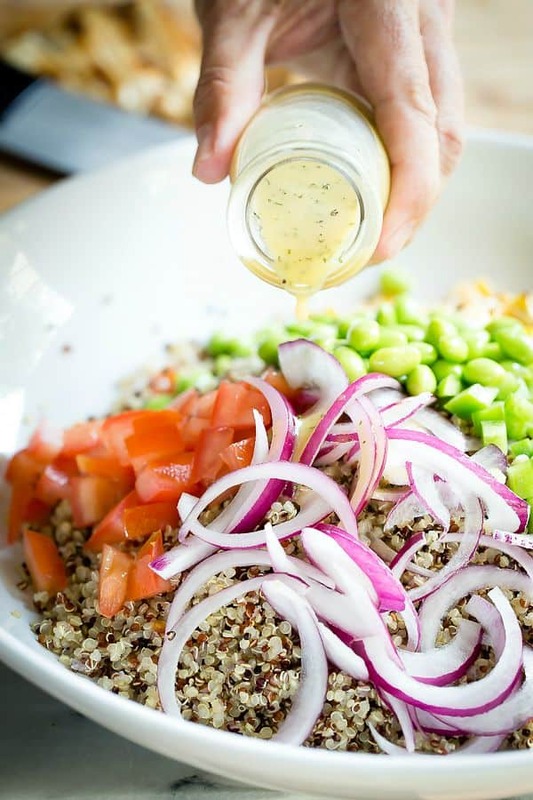 Make the dressing while the quinoa is cooling. Place all of the dressing ingredients in a blender or food processor except for the oil. Pulse on high speed until well mixed. Slowly drizzle in the olive oil with the machine on high and blend until the dressing starts to emulsify. Set aside. Once the quinoa is cool, transfer it to a large mixing bowl. Add the garbanzo beans, peppers, onion, cilantro and feta. Gently toss together then start to add the dressing. Once the dressing has been added toss again and transfer to a serving bowl. Add some more cilantro or feta to garnish. Serve at once or keep in the fridge until ready to use. Love this salad for summer picnics and BBQs! This looks like the perfect summer salad. I love the balance of fresh flavors and the addition of feta! Yum! This looks amazingly delicious, nutritious and perfect for spring!! so colorful and fun looking who in the world would not want to sink there teeth or rather fork into it! I mean it screams summertime! lovely spring salad! love feta cheese! Can’t get enough of quinoa! This looks scrumptious. This is absolutely beautiful and I love the freshness of this salad. It sounds as though you guys had a wonderful Mother Day. And that bloody Mary looks fantastic (phallic or not). 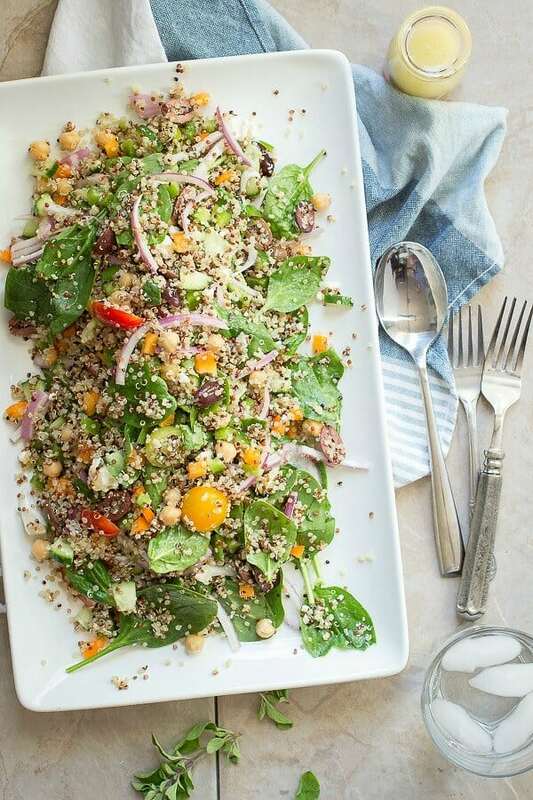 This quinoa salad is exactly the sort of thing I could happily bring to every summer potluck (and then eat half of it myself). Wow what a Mom’s Day. Fun! I like your comment that you can’t screw up on this kind of a salad. Yay! I am scheduled for a barbeque this Sat. I normally take potato salad, But ya know, I am going to branch out! So one of the pictures looks like you have added edamame…. Nice addition! I love everything about this salad!!! From the quinoa to the roasted red peppers to the feta! must make! I am so into this salad!!! I didn’t realize Quinoa had been around that long. But it sure is the grain of the year these days. What works out, its actually good. My first introduction was via a salad and I was hooked. This is another great version of the versatile grain. This salad is delicious! I just made it for a party tonight. I had a few spoonfuls to check on the taste, and I love the tangy dressing but a little sweetness from the red peppers. Thanks for sharing! I love everything about this salad!!! YUM. Loving the tricolor quinoa, I will have to look for it! This is my kind of eating!! Looks delicious. Do you have any recommended substitute for the red and yellow peppers to make it different? Hi Maz, maybe try some zucchini or carrots? Are you fricken kidding me?!?!?! I pinned this receipe about two years ago and just made it tonight. What am I stupid?!?!?! I could have been eating this deliciousness every week for that long!!!!! I used fresh bell peppers and mixed with baby spring mix and baby spinach. LOVED IT!!! This is my kind of quinoa salad!